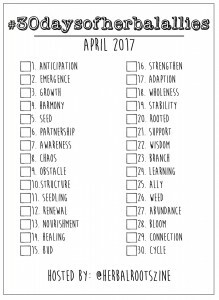 I had such wonderful feedback about “discovering” a plant in your back yard to study for the year that it gave me an idea to offer up a challenge for April so #30daysofherbalallies was born! Each day in April, post of photo on your favorite social media of choice (Instagram, Pinterest, Facebook, Twitter…) of something herbal that relates to the key word for the day. You may choose to stick to your chosen herb or randomly select plants/herbal medicine as you feel drawn to that matches the herb. Or do a mixture of both, focusing mainly on your chosen herb with a smattering of random plants that catch your eye throughout the month. The point is to have fun, raise your awareness of the plants around you and to get outside in fresh air every day! How do you relate to herbs? What are you most drawn to? If you are choosing to focus on one plant, how do you think this can deepen your awareness of that plant? This is a great exploratory activity to practice with your kids (or yourself) to really get to know a plant or observe the plants in a way you might not have thought about before. I hope this month long activity will find you all taking to the outdoors with camera and sketchbook in hand, ready to capture the plants that grow in your back yard. Photos could be of the plants themselves, medicine made from the plants, artwork of the plants, a jpeg of a poem you’ve written or anything else that speaks the daily key word to you. Mix and match, let’s have fun with this! I hope to see my Instagram feed flooded with #30daysofherbalallies as we celebrate our #2017herbalmascot! This photo challenge is set for April 1-30. I will post reminders as we get closer to April 1. 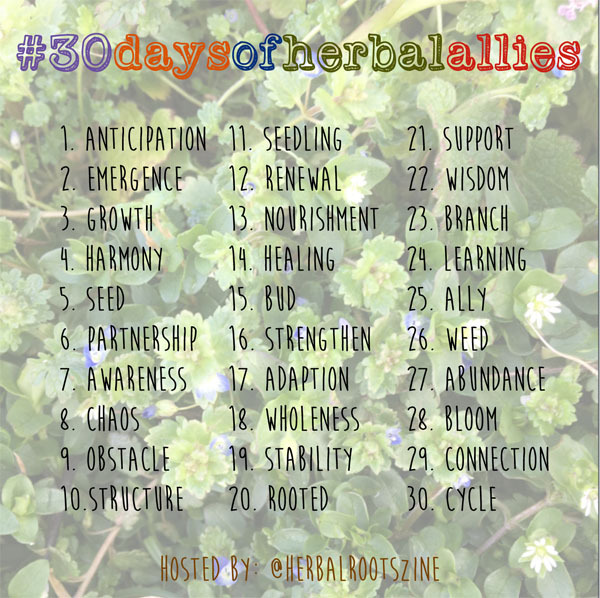 Be sure to add the hashtags #30daysofherbalallies and #2017herbalmascot to your post so that anyone participating can view and see all the lovely herbal goodness we are posting! I’ll be posting pictures to my Instagram account, feel free to follow me: @herbalrootszine. If you’re a bullet journal junkie, you can download a printable to print, cut and paste into your bullet journal here. Do you think this is a challenge you will do or enjoy doing? Do you think your kids will enjoy it too? If you decide to do the challenge, will you focus on one plant for the month or a variety? Or both? This entry was written on March 22nd, 2017 by KristineBrown and filed under Uncategorized. Enjoying this opportunity to work with my #2017HerbalMascot Chamomile, thank you! Sadly not able to use Instagram to post my journey (my phone and IG app are not being cooperative) I am able to blog a bit about Chamomile and am using the challenge to inspire posts.